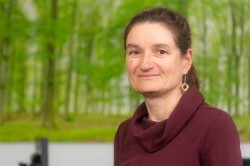 Dr Sabine König (54) assumed the role of Administrative Director of the Helmholtz Centre for Environmental Research (UFZ) on 11th March 2019. She takes over from Prof. Dr Heike Graßmann, who has been the Administrative Director of the Max Delbrück Center for Molecular Medicine (MDC) in Berlin-Buch since 1st October 2018. "In Sabine König we have gained an expert who is familiar with the research system from two different angles," says Prof. Dr Georg Teutsch, UFZ Scientific Director, going on to say: "With a PhD in Physics, she knows how research and scientific work operate. Through her roles as Science Manager at Fraunhofer and Max-Planck, and as a University Chancellor, she also understands the underlying administrative processes. This is a good mix." "I’m delighted to accept this formative role at the UFZ and to share my experience from science and higher education. I am particularly impressed by the UFZ’s scientific excellence, as well as the broad range of research topics that contribute to greater understanding of the environment. My aim is to maintain the supporting parameters for this outstanding research, and to improve them where possible. In doing so, it is important for me that science and administration work closely together;" says Sabine König. Dr Sabine König studied physics at Karlsruhe and Dublin, and wrote her doctorate at the Technical University of Munich. Following positions at CNRS in France, at McKinsey & Company and at the Fraunhofer Society, she helped develop the Max Planck Institute for the Science of Light in Erlangen by acting as a consultant to the Board of Directors and as the head of the non-scientific department from 2003 to 2014. In October 2014, Dr Sabine König assumed the role of Chancellor at Wilhelm Löhe University in Fürth. As a member of the university management team, together with the President and Vice-President, she was responsible for determining the strategic direction of the Wilhelm Löhe University and for organising non-scientific tasks. These included university and student administration, marketing, financial planning and budgeting.